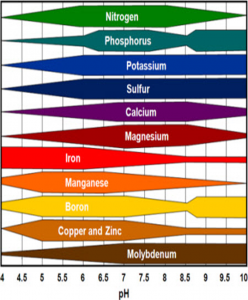 Soil pH influences many of the chemical and biological properties of soils that are important to the growth of plants. Acid pH levels commonly decrease availability of nutrients like nitrogen and phosphorous to the point where plant growth can be significantly reduced. A common technique to alleviate problems associated with acidity is by adding liming materials. Often times we solely focus on fertilizer application and neglect considering the importance pH plays in nutrient availability. 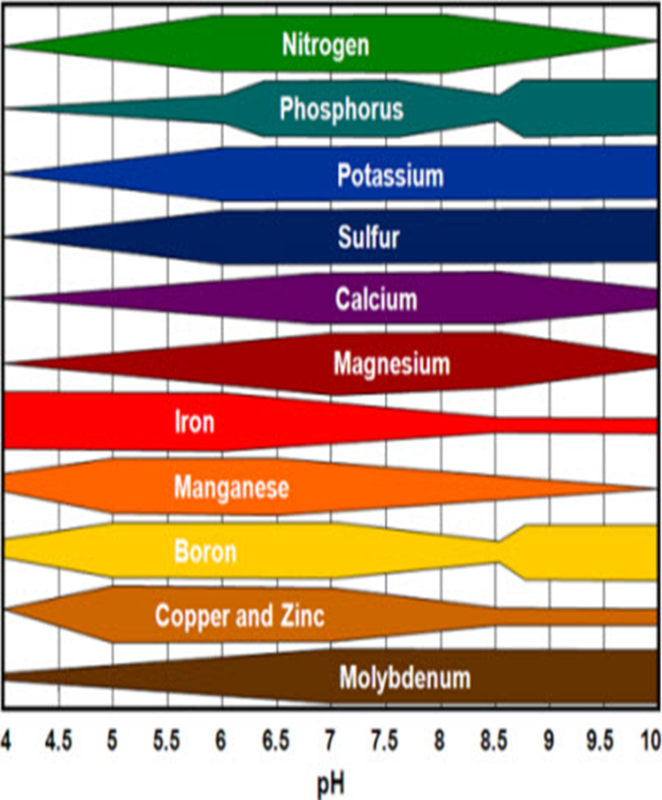 The following picture illustrates the availability of nutrients to plants at different pH values. Notice the most relative availability, according to the graph, occurs at pH of 6.5 as opposed to the lesser availability at pH of 4.5 and 9. When liming a soil, the amount applied is dependent upon several factors. In general, sandy soils need less lime to get a desired pH change compared to fine textured soils. This is due to sandy soils having a lower CEC (cation exchange capacity) compared to fine textured soils. CEC values are usually listed on your soil test report. With a lower CEC, the soil will generally require less lime. The amount of lime applied is also dependent upon the magnitude of the change in pH required. A small change in pH requires less lime compared to a large change. The chemical composition of the liming material along with the fineness of the liming material will also determine the amount needed. The fall is a good time of year for lime applications, since lime should be applied 3 to 6 months before planting. Ground limestone is the most common and most widely used of all liming materials. It is relatively cheap compared to the other types of lime. The two important minerals found in ground limestones are calcite and dolomite. When little or no dolomite is present it is referred to as calcitic limestone; as the magnesium content increases, it grades into dolomitic limestone. The effectiveness of a liming material is determined by its chemical makeup. 100% pure limestone is considered to be 100% effective in its ability to neutralize acidity. Hard limestones need to be ground to sizes specified by law to increase their solubility through increasing surface area. Example: The relative efficiency rating of calcitic limestone consisting of 80% passing a 60-mesh sieve, 17% passing a 10-mesh but not a 60-mesh sieve, and 3% not passing a 10-mesh sieve. Given this lime has a CaCO3 equivalent of 93%, its effectiveness would be 0.93 x 88.5% = 82.3%. Thus if the lime recommendations were 1 ton of 100% CaCO3 lime per acre, it would require 2000/.82 = 2439 pounds of this particular lime. Last updated April 19th, 2016. Technical problems, contact support.